Wipe down those windows. This task should be more fun than usual given the lovely scenery that is typically visible from summer homes. Don’t forget anything; windows, shutters and screens. 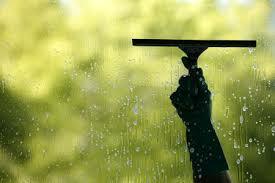 Prior to watering down the surface, be sure to use a broom to get rid of dust and spider webs. Be on the lookout for nests of bees, hornets or wasps. Clean the driveway. If your driveway is made of asphalt, throw in a scoop of laundry detergent in a gallon of water. On the other hand, concrete driveways can be cleaned with ¼ cup dishwashing detergent mixed in a gallon of water. Use a push broom to scrub the ground then rinse the solution away. If there are any grease stains, use kitty litter or a commercial grease remover to get rid of it. Change your AC filter. Depending on what state you live in, you will likely need to run the AC in the summer. It is imperative that AC filters be changed or cleaned each year so that the air quality does not compromise your health or the occupants’. Sort out the pantry. Throw out anything that has gone bad or that is past its “use by” date. If the package or can does not have any label, it’s best to play it safe and throw it out anyway. Air out your mattresses. In order to keep bed bugs and mites at bay, it is essential to air your mattresses out at least twice each year. Vacuum them thoroughly and soak your sheets in hot water for extra security.